Small, light, streamlined packages are the key to GPS for birds of prey. If the environment is conducive to solar rechargeable GPS units then it is well worth considering. 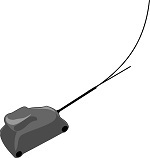 Alternatively Telemetry Solutions makes very lightweight GPS tracking devices with options such as including a VHF transmitter and wireless remote download. Whether you decide to use a primary battery powered tracking device or a solar rechargeable GPS tracking device you will have the opportunity to set the GPS positioning schedule before you deploy the unit on a bird. After deployment, assuming that you have chosen to include a VHF tracking beacon, you will use your VHF receiving gear to locate the study animal and then switch over to the UHF receiving equipment to trigger an on demand data download. The maximum range of the data download is 400 meters with a direct line of sight to the device.